M A T C H A is officially amongst my top 10 favorite things of all + it is such a killer nutritious powerhouse! To be completely honest, I've never really been into "tea" but when I finally gave matcha a try—I got hooked (instantly) I was done for. I even just forced Blu to order a cold matcha drink from True Foods last night for dinner and she drank that drink in minutes! Matcha literally means "powdered tea"—finely milled green tea powder—one of the most pure, nutrient dense + high quality forms of tea! It's the green tea from the *legends (or so they say) and it's simply amazing. Matcha is essentially green tea leaves that have been sone-ground into a delicate powder and because you're consuming whole leaves in matcha, you have the potential to get about three times as much caffeine than a cup of regular steeped tea! Compared to coffee (not a coffee girl) matcha greets an "alert calm" due to the natural substances it contains that will provide relaxation without drowsiness. I love giving myself the *energy boost I need early e v e r y d a y (or even sometimes later) on in the day! 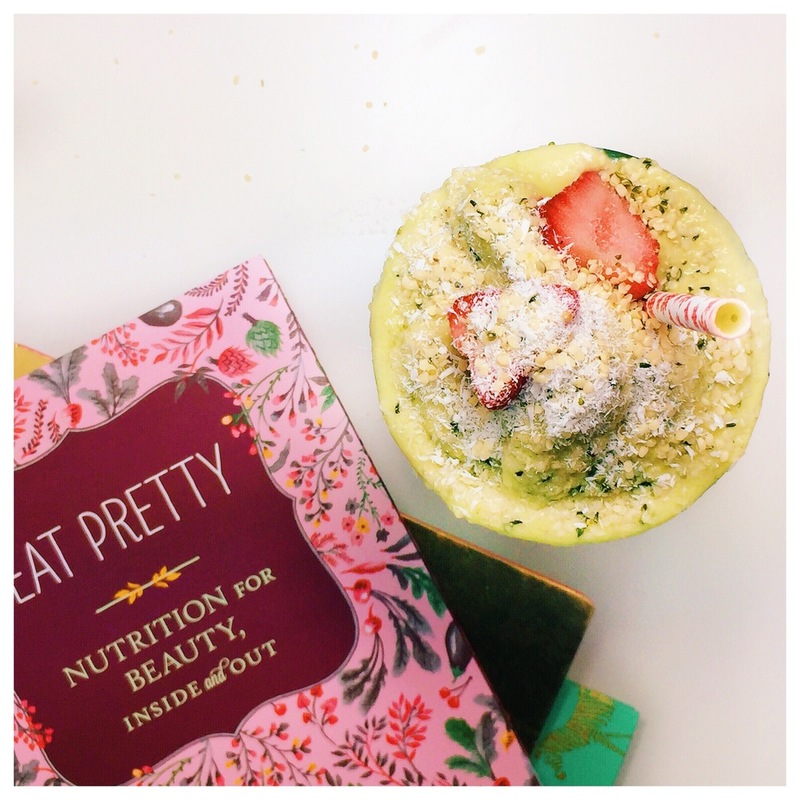 Below is a simple, but really delicious smoothie to kick start your day! T O P P I N G S: frozen strawberries, finely milled coconut + Trader Joe’s super seed and ancient grain blend of sprouted buckwheat, sprouted millet, chia seed, golden flax seed, red quinoa, shelled hemp seed, and amaranth! Combine all ingredients + a few ice cubes in a NuriBullet (or different type of blender) for about 30 seconds or until smooth.